The Amazon Kindle HDX 7 inch tablet is now shipping out to customers to the USA. This is the latest generation offering that is a significant upgrade to the entire product line of Kindle Fire tablets issued last year. The 7 inch HDX has a resolution of 1920×1200 at 323 PPI. Amazon is hyping up reduced glare, dynamic image contrast, and improved brightness for better viewing in any lighting conditions. Underneath the hood is a quad-core Snapdragon 800 processor that is running at 2.2 GHZ and 2 GB of RAM. There is also a dedicated on-board graphics with the Adreno 330 graphics engine. All of these things combined will be one seriously powerful unit that will be able to tap into the extensive Amazon App Store and be able to run any app or game that you can throw at it. It will also be useful for viewing videos and movies as part of Amazon Video. Amazon has the speakers at the top of the device now and audiobooks/movies will sound really good with Dolby Audio. Living in Canada, sometimes we get the short end of the stick and although pre-orders are now available, the HDX 7 and 8 tablets won’t ship out until November 26th. Hi guys too easy. 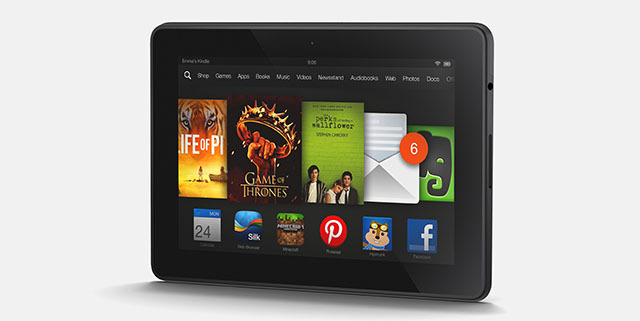 My choice of eBook reader and tablet is the Kindle Fire HDX 8.9 inch which will be out a bit later. However I believe that my brother’s boy Charlie would love the 7 inch Fire tablet.